Moving to UC isn’t just about taking calls from your PC. Voice, music, multimedia, web-based training, conference calls and more. And all you need to do all this is the C320-M Blackwire Headset. 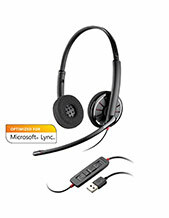 This comfortable and easy to use USB headset incorporates some surprising audio features – features you would not normally expect in a headset of this price. Wideband audio for natural sounding conversations, a noise-cancelling microphone to reduce background noise and enhanced Digital Signal Processing (DSP) means you get the best and most natural call quality possible. This headset also comes with Dynamic EQ. Dynamic EQ automatically optimises the sound quality depending on what you are using the headset for. This means you get the best from headset, whether you are listening to music, attending a webinar or taking a phone call. A great headset for a great price, the C320-M Blackwire USB headset is ideal for those new to PC telephony and organisations who are looking to roll out UC.